At some point, every fitness and bodybuilding junkie has been bombarded with outlandish claims of workout supplements promising overnight gains, super strength, and an instant ripped physique. These “magic pills” all claim to give you amazing results, but most of the time, they’re false at best and downright dangerous at their worst. This might leave you wondering if there are really any pre-workout supplements that actually work – without an endless list of unwanted side effects. Agmatine sulfate is a naturally-occurring derivative of the amino acid arginine. It carries out many important functions in the body, including acting as a neuromodulator and neurotransmitter within the central nervous system. It also plays an important role in nitric oxide synthesis, which promotes healthy circulation and muscle pump. Agmatine sulfate is popularly taken as a bodybuilding supplement, but it does much more than give you a serious muscle pump. 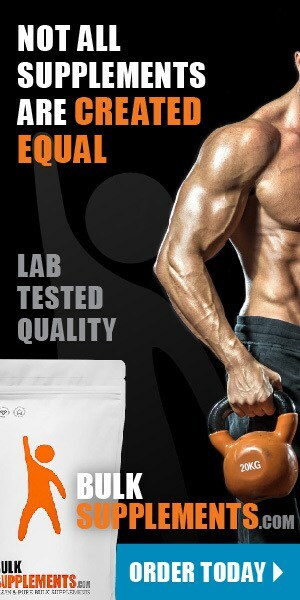 Of all the known benefits of agmatine sulfate, its ability to build muscle is the most popular. 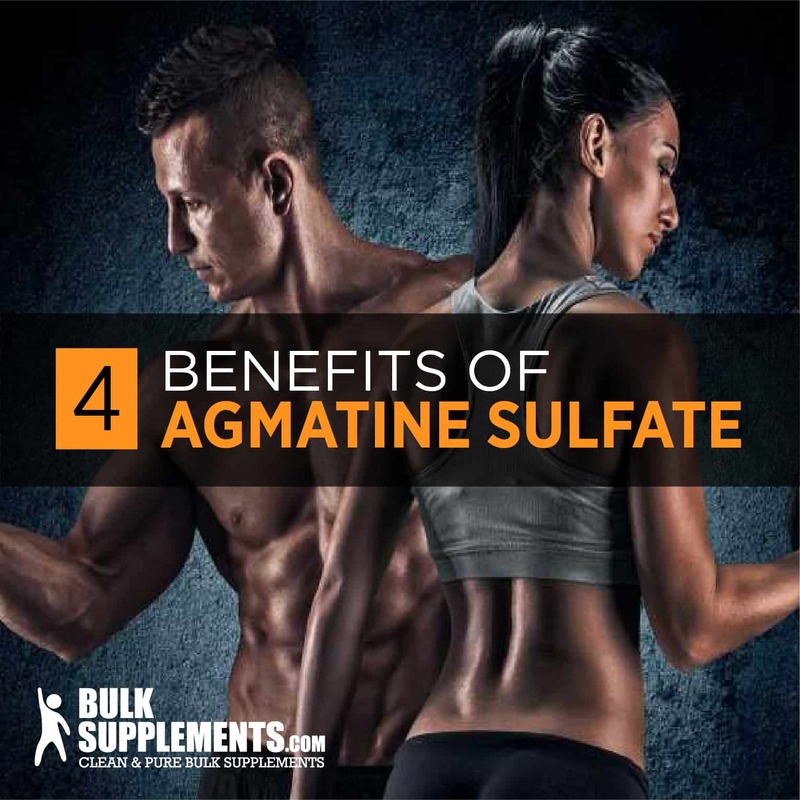 When used in conjunction with weight lifting and resistance exercises, agmatine helps to fuel muscle growth through a few different mechanisms. Some people report having an increased appetite when taking agmatine sulfate powder—another benefit for bodybuilders, as a bigger appetite means a bigger caloric load, which can help build lean, strong muscle faster. 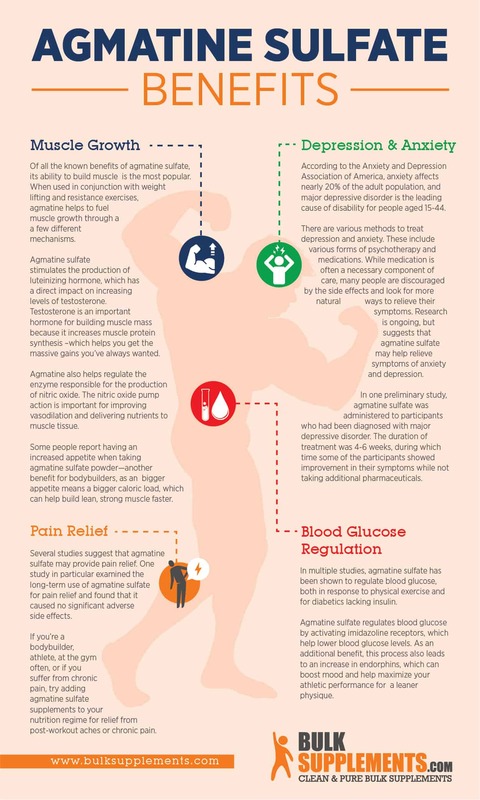 If you’re a bodybuilder, athlete, at the gym often, or if you suffer from chronic pain, try adding agmatine sulfate supplements to your nutrition regime for relief from post-workout aches or chronic pain. There are various methods to treat depression and anxiety. These include various forms of psychotherapy and medications. (x) While medication is often a necessary component of care, many people are discouraged by the side effects and look for more natural ways to relieve their symptoms. Research is ongoing, but suggests that agmatine sulfate may help relieve symptoms of anxiety and depression. Agmatine sulfate regulates blood glucose by activating imidazoline receptors, which help lower blood glucose levels. As an additional benefit, this process also leads to an increase in endorphins, which can boost mood and help maximize your athletic performance for a leaner physique. It can be difficult to get an adequate amount of agmatine sulfate through food alone, especially if you’re taking it for therapeutic or medicinal purposes, which is why agmatine sulfate supplements could be a beneficial addition to your nutrition routine. Because the supplement can be taken to address numerous health issues, there is currently no standard agmatine sulfate dosage. 1 kilogram is equivalent to 2.2 pounds. Next, take your weight in kilograms and then multiply it by the number of agmatine milligrams to determine your agmatine dosage range. The dosage range for a 120lb person would be between 87 mg and 349 mg of agmatine sulfate. It’s important to accurately measure the dosage of agmatine sulfate powder to avoid exceeding the maximum recommended intake unless you first discuss it with your doctor. Biologically, agmatine sulfate utilizes the same transport mechanisms as arginine, so absorption can be hindered when taken with protein. (x) For best results, do not take agmatine sulfate powder with other supplements and do not exceed the recommended dosage to compensate for hindered absorption if you do. Reports of agmatine sulfate side effects are more anecdotal than research-based. Sources do cite known side effects of L-arginine, which is closely related to agmatine sulfate. These include mild effects such as bloating, abdominal discomfort, diarrhea, low blood pressure and allergies, particularly those that affect the airways. (x) Anecdotal reported side effects of agmatine sulfate include increased appetite, minor gastrointestinal discomfort and lowered blood pressure. Agmatine sulfate can interfere with the absorption of some medications. Likewise, certain medication can affect the absorbtion of agmatine sulfate supplements. (x) Anyone with a known pre-existing medical condition should consult their doctor before taking agmatine sulfate to assess the risks of potential medication interactions. Agmatine sulfate is a naturally-occurring amino acid derivative that has proven to be a beneficial agent in a number of health-related applications. If you’re looking to maximize your workout, build lean muscle, ease post-workout pain and boost your mood, agmatine sulfate is a beneficial supplement to add to your nutrition routine.